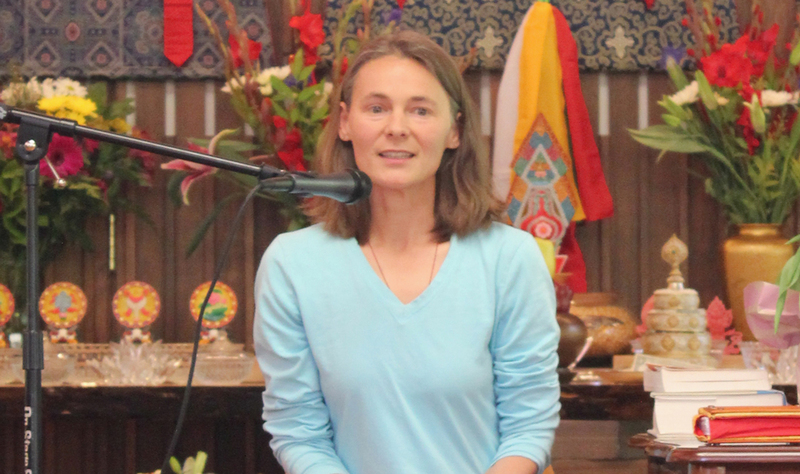 By now, Heidi Nevin is well-known to the Saraha community as a frequent visitor and Tibetan language interpreter for visiting Tibetan Lamas, including Saraha founding teacher Lama Tsering Gyaltsen and others. In fact, Heidi is a professional translator of written Tibetan works, a mother of two, an ardent vegetarian, and an assistant chatelaine of her family's organic farm. She is a Buddhist practitioner and a devoted student of the great Tibetan Buddhist master, HH Chatral Rinpoche, who is the most vocal and famous proponent of vegetarianism within the Nyingma tradition of Tibetan Buddhism. In mid-December, Heidi accepted Saraha's invitation to conduct a seminar on vegetarianism on Sat. Feb. 13, which came to be entitled "Food for Bodhisattvas : Vegetarian Thinking, Cooking and Living for the Love of Dharma, Animals, People and Planet" as a fundraising benefit for Saraha Nyingma Buddhist Institute. Then, on Dec. 30 of 2015, some weeks after Heidi's initial agreement to conduct this seminar, unexpectedly, in an event of great shock, sadness, and moment for the Buddhist world, her precious teacher HH Chatral Rinpoche entered Parinirvana at the age of 105. Then, as part of traditional seven-week cycle of ritual events in connection with this passing, HH Dudjom Rinpoche, the head of the Dudjom Lineage, requested in an open letter "those who have devotion to him [HH Chatral Rinpoche]" practice vegetarianism, and to do other practices such as live-release of endangered animals at least for the duration of the seven weeks (which extends till Feb. 17)..
We report these events in order that people will become aware, and have the opportunity to connect in practice with the Enlightened passing of HH Chatral Rinpoche, and to obey HH Dudjom Rinpoche's request. HH Dudjom Rinpoche's letter expresses the essence of devotion towards HH Chadral Rinpoche, who was his primary teacher from early childhood. And, for many of us who have devotion towards young HH Dudjom Rinpoche himself, but have not yet had the opportunity to meet him or receive his teachings, these may be the first words of his instruction or request that we have ever heard. Do we know when the next time or the next words will come? This is an important time and these are important words. Returning to the current vegetarian seminar event, the coincidence of this event with HH Chadral Rinpoche's passing, and with HH Dudjom Rinpoche's subsequent request for people to practice vegetarianism now, is just that, a type of coincidence. If we have a positive view we can see this as a positive coincidence. If we believe in the timeliness of wisdom blessing, this very much fits the bill. Then we can be inspired and want to do virtuous things, such as spare and save the lives of animals, more and more. In this event, Heidi will discuss vegetarianism according to the unequivocal instructions and exhortations of Buddhist masters to practice it; and the Buddhist vows and promises of altruism that practitioners undertake; and the many collateral benefits to others, to the planet and oneself that that this practice entails. We hope she will also speak according to the words of her perfect teacher, HH Chatral Rinpoche. 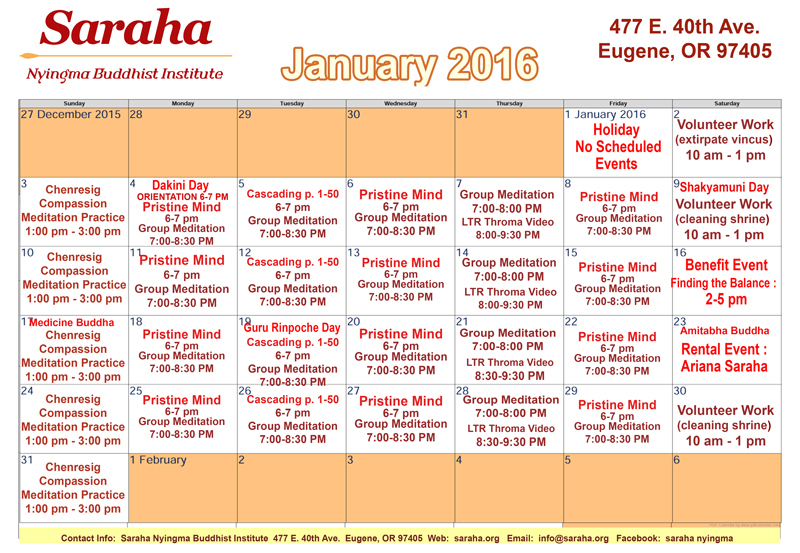 The Saraha Nyingma Buddhist Institute, or "Saraha" for short, is a registered 501(c)(3) status non-profit religious organization based in Eugene, Oregon, USA. 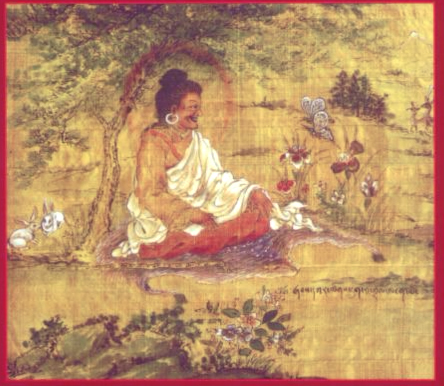 Following the Buddha's teachings of Enlightenment, and practicing according to the Dudjom Lineage of the Nyingma School of Tibetan Buddhism, Saraha offers a full schedule of regular temple meditation events, special teachings events, and educational courses. Saraha also operates Saraha Children's School, grades K-8, an award-winning, Oregon State registered and approved children's school, featuring small class size, project-based learning, with a full and rigorous academic curriculum, art, music, dance and Tibetan, infused with child-oriented Buddhist teachings of compassionate virtue, mindfulness and wisdom. Altogether, Saraha intends to offer a community-based, family friendly atmosphere where students young and old can visit and grow in age and wisdom together. For more information, click our online calendar HERE. Open to the public, everyone welcome.